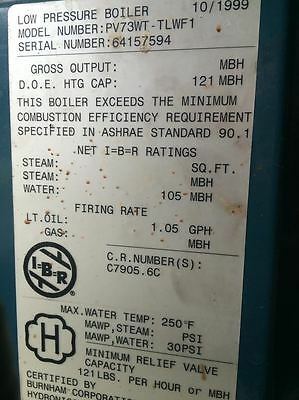 How to determine the date of production/manufacture or age of Thermal Solutions® Commercial Boiler HVAC Systems. The date of production/manufacture or age of Thermal Solutions® Commercial Boilers HVAC equipment can be determined from the “Year built” date located on the data plate. Parent Company: Burnham Commercial a subsidiary of Burnham Holdings, Inc. Description: The model number, serial number and manufacturing date are located on a silver label on the inside panel. The manufacturing date appears in the upper right corner of the silver label in the MM/YYYY format. If the tag fails to provide this information the manufacturer must be contacted. When contacting the manufacturer have the model & serial number handy. (See the data tag below).